'has become'?? when did i ever say it was otherwise?? What were your questions to Buffett? We had a long Q&A period so it's too long to get into here. However, I will say that there was very little I heard from Buffett that I have not heard from him before, having watched many of his interviews and read other transcripts. That's so cool. 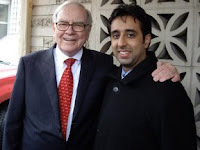 How did you arrange to meet with Buffett? Ebay auction or through school or some other way? I would love to meet this guy. When I was an MBA student he invited our class down. Quite something the way he volunteers his time like that. You and your classmates make like this new book on "decision framing." Description: "The Four Filters Invention of Warren Buffett and Charlie Munger" examines each of the basic steps they perform in "framing and making" an investment decision. This book is a focused look into this amazing invention within "Behavioral Finance." The genius of Buffett and Munger's parsimonious four filters process was to "capture all the important stakeholders" in a "multi-variable" equation or formula. Imagine...Products, Enduring Customers, Managers, and Margin-of-Safety... all in one mixed "qual + quant" formula. Other important ideas are embedded in each chapter. The book can be used as a supplemental textbook in a Valuation or Decision Sciences course. I would love to go to meet Mr. Buffett. do you go to omaha for the shareholder meeting? I went this year for the first time and it was amazing! I've never been to the annual meeting, though they certainly sound like fun! This meeting took place through my MBA class. Lucky person you are indeed I can say! I have a web site where I research stocks under five dollars. I have many years of experience with these type of stocks. I would like to comment about warren buffett. I do not believe warren buffet is the value investor that he was years ago. if he was he most certainly would have caught the spectacular come back of ford motor the shares of ford motor were trading at only 1 dollar a share two years ago today they trade at 16 dollars a share and the company is well on its way to becoming the number one world automobile company. another example is apple computer the shares were trading at just 5 dollars in 1998 today they trade at 340 dollars a share he totally missed this one also. their are dozens of other examples. I invested in Gazprom, now sitting in the red.